Before I get too far into today's post I would like to say that I owe many of you some blog love and commenting. I apologize for my absence. I was recovering from strep throat and I just took my last nasty antibiotic today! So I plan on catching up with my commenting and I thank you for being loyal followers and friends!! Big hugs to you all. It's time for a new challenge at The Perfect Sentiment! The Twist: use some form of distressing on your card...paper tearing, roughed-up edges, inking, crumpling, etc. I however, love to distress and ink and quite frankly, if you see a card without those techniques you can rest assured it's not mine. I just feel like something is missing if I don't. Stitchy Bear will award one random winner a $10 Gift Voucher! Do they ROCK or what? They also provided us with images to work with. I used the Shaded Flower. I distressed the edges of all my papers. Then I inked the base of the card with Pumice Stone Distress Ink. I used Crumb Cake seam binding for my ribbon and bow. My image is colored with copics which I am still learning how to work with. My sentiment is from the fabulous Verve set "Words Cannot Express". used my copics which I'm often afraid to use! 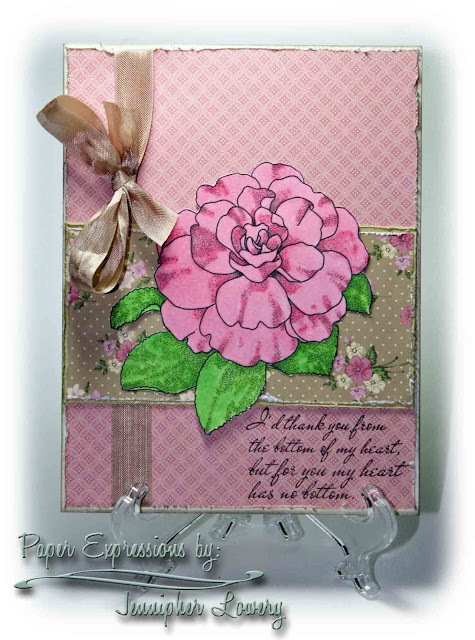 use some seam binding I've been hoarding and some old Springtime Vintage designer paper from Stampin' Up! Thanks for blessing me with a visit to my blog today! I would love it if you would sign up to follow me. If you do, be sure to leave me a link to your blog or gallery where I can keep track of you. Such a pretty card and an awesome job with your copics! I'm still learning how to use them. Thanks for playing along with the Use Your Stuff blog this week. Lovely sentiment and a gorgeous card, love the pretty papers you have used. Glad to hear you are on the mend. What a lovely thank-you card! I love the sentiment especially, but all the distressing looks so pretty! Sorry you've been out of sorts with strep throat, but hopefully you'll be feeling much better soon! Take care! What a beautiful card. Love the distressing touch. Beautiful card, Jennipher! I love the distressed edges. I'm sorry to hear you were sick. I pray you heal and stay well. what a beautiful card. I love the look that the seam binding gives it. very pretty card this week jennipher you did a fab job on it. What a pretty card! I hope you're feeling better! Beautifully done this week Jenn!! Your flower image is phenomenal!!! Love how all the colors blend on this! Such a pretty card! The paper and image go so well together and I love the sentiment! 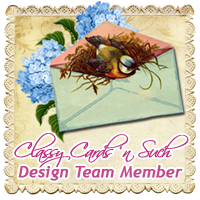 It literally made me say "Awwwww..."
Beautiful card - I love the sentiment...and great colors!! Thanks for joining us at iCopic! I loved doing distressing! Yours turned out beautifully. Keep practicing with your markers-the flower looks great. You'll get more comfortable the more you do. Fantastic Card! I unfortunately have never used Copics but seeing this makes me wanna get some! You did a lovely job with my Shaded flower image! Love the sentiment as well! You Rocked it! Beautiful! Great Sentiment!! Thank you for playing with us this week at Love to Create Challenge & For sharing your talents with us!! Come back and join us again soon!! Your card is beautiful! I love the colors and distressing. Thanks for joining us at Love to Create. Absolutely gorgeous and beautiful sentiment! Thanks so much for joining us this week at Love to Create Challenge. So very lovely. The colors are so pretty and that's a gorgeous flower. What a beautiful sentiment. Your flower just pops off your project!! It is fabulous!! 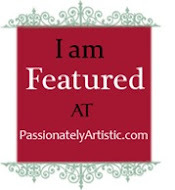 So glad you joined us at The Crafters Cafe Challenge Blog!! Blessings! Lovely. 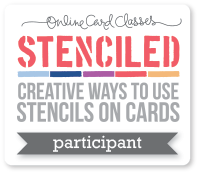 Thanks for joining us at Creative Card Crew. Absolutely beautiful! 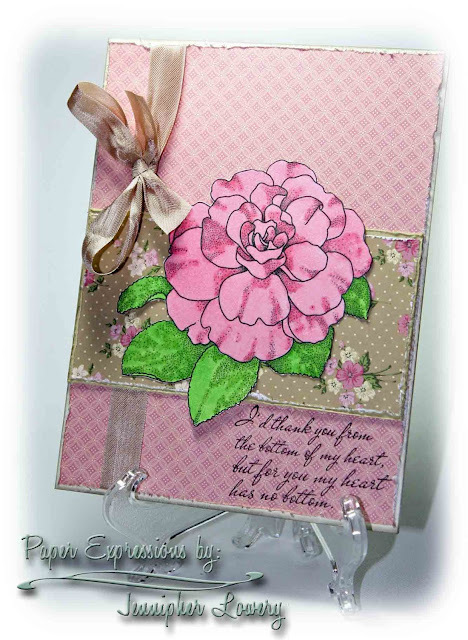 Thanks for sharing your wonderful design with us at Crafter's Cafe Challenge Blog! Very elegant card and love the distressed look. I love the shabbiness of this card!! So pretty with the Seam Binding. I hope you're feeling better by now!! Strep can be nasty and is for sure no fun!! 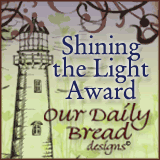 I also want to pass along the Liebster Blog Award to you. I always enjoy stopping by your blog to see what you've been up to. Although lately it's not near as often as I would like. Life keeps getting in the way. lol If you wish to pass it along stop by my blog and pick up the badge. All the details are there. Thanks for all of your inspiration and sharing such beautiful cards!! The quotation on the card is looking so good!